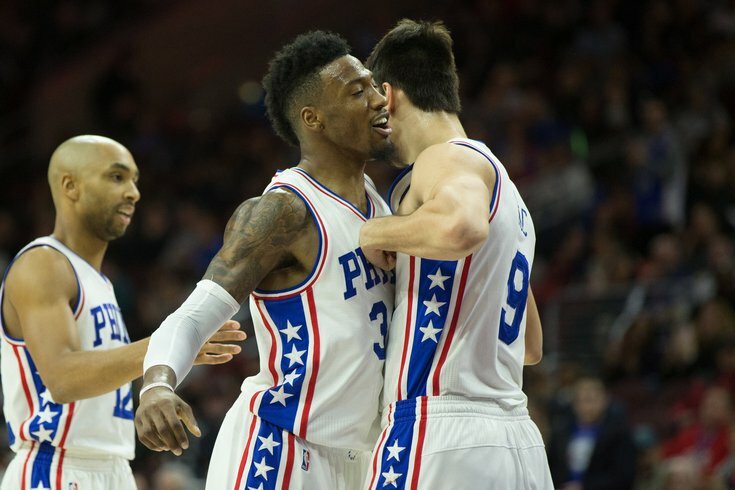 Philadelphia 76ers forward Robert Covington (33) and forward Dario Saric (9) chest bump after a score against the LA Clippers during the third quarter at Wells Fargo Center. The Philadelphia 76ers won 121-110. In many ways, it was just another day in Philadelphia for Dario Saric and Robert Covington. Saric woke up Tuesday morning and got coffee with T.J. McConnell and Sixers director of player development Chris Babcock, hours after going out to dinner with them the night before. Covington, who owns an assortment of reptiles and dogs, was in the process of collecting the last of his pets to bring to his new home. NBA Trade Rumors: Does Dennis Smith Jr.'s availability impact Markelle Fultz market? But this was not a usual day at the Wells Fargo Center. It is the first time they'll be in Philadelphia as the enemy, with their Minnesota Timberwolves in town looking to steal a win. "It was weird. I never entered the arena through [the visitor's door], it was weird to see how the arena looks from that side," said Saric at Tuesday morning's shootaround. "I feel it's just different atmosphere than other gyms, other arenas. I see the court, I see the Philly, it's a little bit — I remember some things." "I think my relations with the people were very good. I've got friends, friends in the locker room there and the staff too. That's one thing, you know? Playoff run is another thing, it was just an amazing atmosphere... everything else, this was my first American home, so of course you have some things you remember." Life has changed in a big way for both franchises since the trade. The Timberwolves are the team of Karl-Anthony Towns and Andrew Wiggins now, with everyone else falling in line behind their two young players. The Sixers are still trying to figure out the hierarchy with Jimmy Butler in the mix, with some of those discussions spilling out to the public through media reports. Even if you can't see the impact Covington and Saric have had since arriving in Minneapolis, you will certainly hear it. It was not a surprise to hear Covington's voice (and laugh) as soon as shootaround was opened to the media, joking with Towns about what it was like to dunk for the first time. The two razzed Saric about it, suggesting it took a bit longer for him to claim his first dunk than many of his peers, and Saric laughed it off as they cooled down with some free-throws. That dynamic will sound familiar if you paid close attention to the Sixers while Covington and Saric were here. His teammates loved to mess with him, McConnell in particular, and Saric always got just mad enough to make it funny without it boiling over into a real conflict. That was the genesis of, "Trust the Friendship," the less-publicized but critically-acclaimed sequel to, "Trust the Process." Having someone like that in the locker room, content to roll with the punches even when he's being doused with foreign substances, is invaluable for getting through the 82-game grind. Timberwolves interim head coach Ryan Saunders, who took over for Tom Thibodeau just nine days ago, sees the value of Covington and Saric elsewhere. "One thing you can never take away from those guys or underestimate is their passion or will to win," said Saunders. "Any team would miss them, taking that away from them." If you can make it [in Philly], you can make it anywhere. This is my true first home, I'll always love here, and I wouldn't change it for the world. Covington would probably agree with his new head coach there. He saw this thing through in Philadelphia from the lowest of lows through the highest of highs, arriving a year before the Sixers won just 10 games and departing the season after they won 50+ for the first time since 2001. If any player has a claim to helping build the culture in Philadelphia, it's him, and Covington was essential in Philadelphia's elite defensive performance last season. He walked back into the Wells Fargo Center like he never left. Covington greeted the assembled press with a big smile despite the fact that he won't be able to suit up on Tuesday night, and he explained that his message in Minnesota is the same as it was in Philly: just keep grinding. "Adversity is going to hit no matter what. You got to take the good, the bad, learn from all your mistakes, learn your lessons. Ultimately, each and every day you got to come in and get better," said Covington. "We've done a lot team-wise to try to change the mentality...I'm just trying to be a great leader on and off the court, same way I was here, leading by example and doing the right things." "If you can make it [in Philly], you can make it anywhere. This is my true first home, I'll always love here, and I wouldn't change it for the world." As reports circulate about discord in Philadelphia's current locker room, it's worth reflecting on what these two brought on that front, setting aside their impact on the court. Covington did not transform from a D-League player into an All-NBA defender by accident. Saric hasn't overcome fairly serious athleticism concerns without dedication. These guys showed up every day, put in the work, and did so with a smile on their faces, prepared to do what it takes to help bring the team along. The jury remains out on whether the partnership with Butler is one that will work long-term. The numbers suggest that when Joel Embiid, Ben Simmons, and Butler share the floor, good things happen for the Sixers. With a better bench, perhaps we don't even get to the point of discussing their fit concerns. But right now, there is an awkward dance of figuring out who will lead the way forward and how. Embiid rightfully believes this is his team, and things should run through him. It is harder to get that message across to a famously thorny star if you don't have guys like Covington and Saric in the locker room, fence menders and impactful players with enough ownership of the team to effectively squash beef. During a walk-off interview late in his rookie season, Saric described what it was like to be a part of this group in Philadelphia. Just a couple years later, it sounds a lot like what the Sixers are missing right now. "We support each other even if somebody miss the shots," Saric said. "Like T.J., I always come and say, let's go T.J.! I think we've got some good relations, we can maybe fight during the game, but we forget that, and after that, we are like best friends on the court. That, for basketball and for team spirit and for team chemistry, it means a lot." If the current Sixers take anything from their meeting with a couple of old friends, it should be that.